Pope Francis made history on Thursday by performing a mid-air wedding ceremony for two flight attendants on a plane flying over Chile. 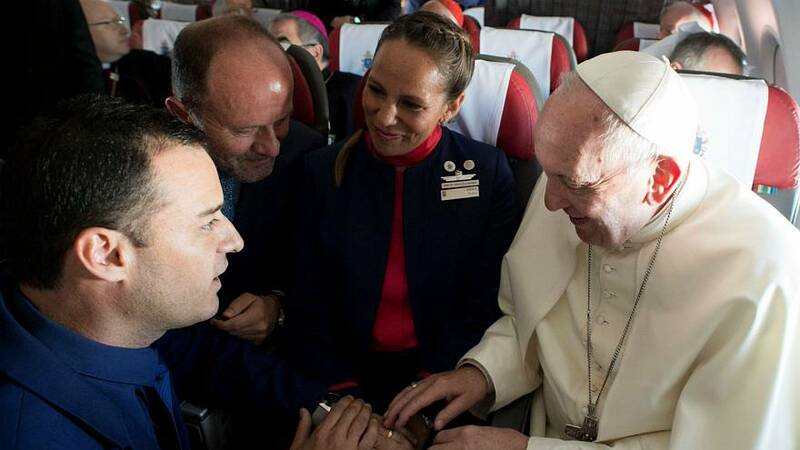 LATAM cabin crew members Paula Podest Ruiz, 39, and Carlos Ciuffardi Lorriaga, 41, were already married in a civil service but asked the Pope to carry out the impromptu religious ceremony on the plane from Santiago to Iquique to bless their union. The couple said they had planned a religious ceremony in their parish church in Santiago but it had to be moved because the building was damaged in an earthquake in 2010. "We had a short and small ceremony. He took our hands and he asked if there was love in our marriage and if we want to keep on being together all lifelong. “I am getting emotional as I say it. It is not easy. We said yes," Elorriga told journalists after the ceremony. Vatican spokesman Greg Burke confirmed that the pope had married the couple in a religious ceremony, noting that it was something that had "never happened on a papal plane before."